As my quest to try different beers continues, I am thankful that my local Morrisons supermarket has a massive selection of bottled beers from a wide selection of independent and craft breweries from across the UK. 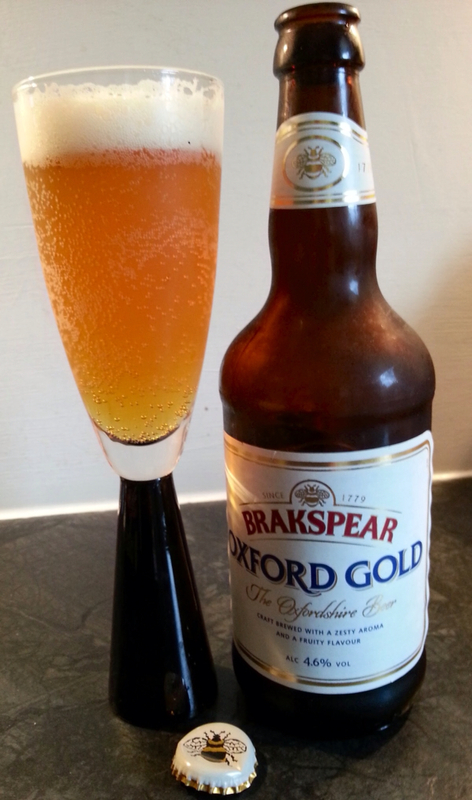 This week I picked up a bottle of Oxford Gold from Brakspear Beers. The Brakspear name has been synonymous with brewing for over 200 years from the days when William Henry Breakspear bought a brewery on Bell Street in Henley on Thames. Following the closure of Brakspear Brewery in Henley in 2002, a £1million redevelopment of the Wychwood Brewery site was undertaken to move the brewing of Brakspear beers. This included moving and re-installing at Wychwood much of the original Brakspear brewing equipment, including the original Brakspear Copper, dating from 1779, and the famous Brakspear ‘Double Drop’ fermentation vessels, used to brew Brakspear Bitter & Brakspear Triple. I was attracted to the packaging of the beer with its red, gold and blue labelling giving a very traditional look to the bottle. With the increasing number of bottled beers leaning towards gimmicky labels, it was nice to see something that looked like a good old fashioned beer. The Oxford Gold is a dark amber colour and pours with a tight foamy head that settles quickly leaving a creamy ring around the top of the glass. The beer is described on the label as zesty and there is definitely citrusy notes competing with the malty aromas on the nose. On first taste the Oxford Gold has a slightly sweet honey flavour, before being replaced with subtle hops. The flavours are simple and clean, and left my mouth with a dry finish. I found the beer very easy to drink, not too bitter, with medium carbonation. As a fan of blonde beers, the Oxford Gold was a welcome addition to my beer fridge and will be welcome back anytime. Keep up to date with Brakspear Beers on Facebook.